For the past few years my research has primarily focused on my maternal lines for two simple reasons: that side of the family has always been interested in our family history and I had more information to start my research with. Last summer, I started to dive deeper into my paternal family history and asked my father if he would be willing to take a DNA test. Being the amazing "I'll do anything for my girls" father that he is, he said yes and we ordered a test through the first release of Ancestry.com's AncestryDNA. My family has previously tested with FamilyTreeDNA and 23andMe and I wanted to see how it compared. The AncestryDNA test allows both the maternal and paternal lines to be tested by analyzing the entire genome (all 23 chromosomes). Our test with FamilyTreeDNA was taken by my uncle and we ended up with Y-chromosome and mtDNA results. Our tests with 23andMe were taken by myself and my grandmother and only reported on our mtDNA. We received my father's Ancestry.com DNA results several months ago. At that time I should have posted about the results, but I shared them with my family and never got around to posting them until now (I know...!). The results are in and there were quite a few surprises. As far as I have been able to trace in my limited (3 to 4 generations past my father) research, his family seems to hail from Germany and the British Isles. I was not surprised by these result as it appears the majority of my father's paternal branches can be traced back to Germany or Austria. I was quite surprised to see such a high percentage of Scandinavian ethnicity. I have not found any documents that document locations in Norway, Sweden, or Denmark (Ancestry's "Scandinavian" locations). This is quite a large percentage! Most of the results I have viewed have between 0% and 3%. Maybe this is where the British lines come in, but it would seem odd that such a well known ethnicity would not show up. 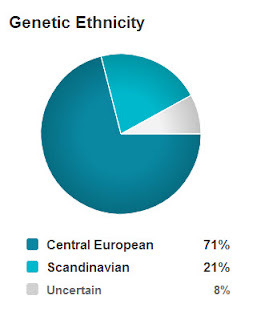 In conclusion, it looks like I have a lot more research to do to help uncover the Scandinavian results. Also, I hope that as more people are tested that his uncertain results decrease.